It came in the night. “Perfect!” said Scott. “Snow!” said Jim. At recess the schoolyard is full of happy kids. Scott is making snowmen. Jim is working on the world’s greatest snow fort. At lunchtime they join forces… to create a perfect snow surprise! Barbara Reid combines her renowned Plasticine art with ink and watercolour panels to bring a timeless Canadian tale of winter fun to life. This book captures the joy and excitement of playing outside in the snow, especially after an overnight snowfall of fresh, pristine white stuff that is perfect for building snowmen and snow forts. My children were delighted with the vivid illustrations the author made with Plasticine that is shaped and pressed onto illustration board. "Look at all the details!" my daughter said as she and her brother poured over the book. It must have taken the author hours to make them because the illustrations have such minute details, making them realistic and colorful. True artistic talent. The story itself was okay but it sounded stilted when read since I found it lacked a flowing rhythm. However, the characters were likable and it shows an older child helping a younger one, and children working together while having fun. There is no plot, really. 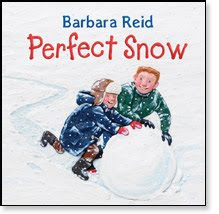 However, if your young children love playing in the snow, this book will capture their attention. Disclosure: A big thank you to Nikole from Scholastic Canada for sending us this book for review. I was not compensated in any other way, nor told how to rate or review this product.